35 Surprise Eggs App Data & Review - Entertainment - Apps Rankings! By tapping one of eggs it will be opened and Surprise Will be released. Kids can open egg by egg and move to other room. ''This is great app for entertaining your kid and satisfy their curiosity. Kids loves it. Favourite app. " " This app is huge helper for at Doctors visits and when our baby is cranky." This app is intended for toddlers and preschool children from 8 months to 4 years of age. 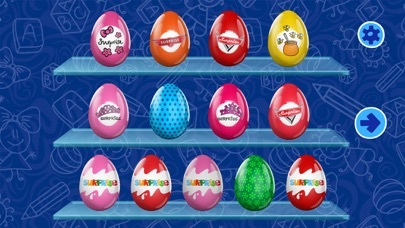 Surprise Eggs is designed for children to satisfy their curiosity and give feeling of surprise and give excitement like opening real Surprise Eggs. * For parents this app will be a helpful tool in game-plays and great way to keep your baby busy and entertained. * This developing game for kids is created in a way that baby can control what's happening in the app. It is great way to train children's self-sufficiency and realise own abilities, also to understand that events can be controlled by himself/herself. * Surprise Eggs biggest advantage is unique simplicity. This app is lead only by your baby's fingertips - that's why it is suitable even for the smallest toddlers! * Each of room has up to 13 eggs. * Kid can return to choice of Eggs by one tap on video again and pressing big 'back' button or smallest ones can easily navigate with one touch. * Easy to navigate between rooms using arrows back or right. Enjoy your baby enjoying it! 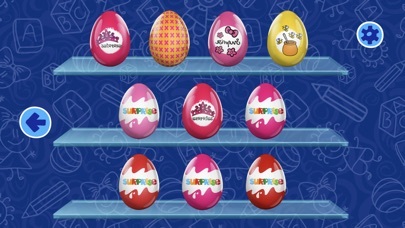 The applications 35 Surprise Eggs was published in the category Entertainment on 2019-02-11 and was developed by KARO SIA. The file size is 81.19 MB. The current version is 1.0 and works well on 8.0 and high ios versions. Do you like 35 Surprise Eggs applications? Please share!